Last year’s Breeders’ Cup Sentient Jet Juvenile champion Good Magic returns to action this weekend in the Grade 1, $1,000,000 Haskell Invitational after a solid run on the Triple Crown trail. The 2017 Eclipse Award-winning 2-Year-Old Male of the Year has just one win as a 3-year-old, he but was a solid second in the Kentucky Derby to Justify, then ran toe-to-toe with the Triple Crown winner in the Preakness Stakes before giving way late to finish fourth. Now that Justify is sidelined with an injury, Good Magic has become the leading 3-year-old in training and will look to take his first steps towards the Breeders’ Cup Classic with a win here. The winner of the Haskell Invitational will receive an automatic position in the Breeders’ Cup Classic this fall at Churchill Downs. Pre-entry and entry fees will be paid and a nominator award of $10,000 will be given to the person who nominated the foal or racehorse. Also, all Breeders’ Cup starters based outside of the state of Kentucky will receive a travel allowance of $10,000 if based in North America and $40,000 if based Internationally. The Haskell Invitational serves as the biggest day of the meet at Monmouth Park. The track will also feature several other stakes races to keep an eye on during this major day of racing. Some of those races could potentially have an impact on the Breeders’ Cup, so they will be important to watch as well. The American-based Breeders’ Cup Challenge Series “Win and You’re In” events continue on August 4 with the Grade 1 Whitney Stakes at Saratoga, which is also a Win and You’re In for the Breeders’ Cup Classic. As usual, a solid field is expected for the race that produced Classic winner Gun Runner last year. The full field for the Haskell from the rail out: Lone Sailor, Navy Commander, Roaming Union, Core Beliefs, Bravazo, Good Magic, and Golden Brown. #6 Good Magic – Going into the summer, this was the undisputed second-best 3-year-old male in the country. After starting his year poorly in the Grade 2 Fountain of Youth Stakes, he turned it around with a nice win in the Grade 2 Blue Grass Stakes. 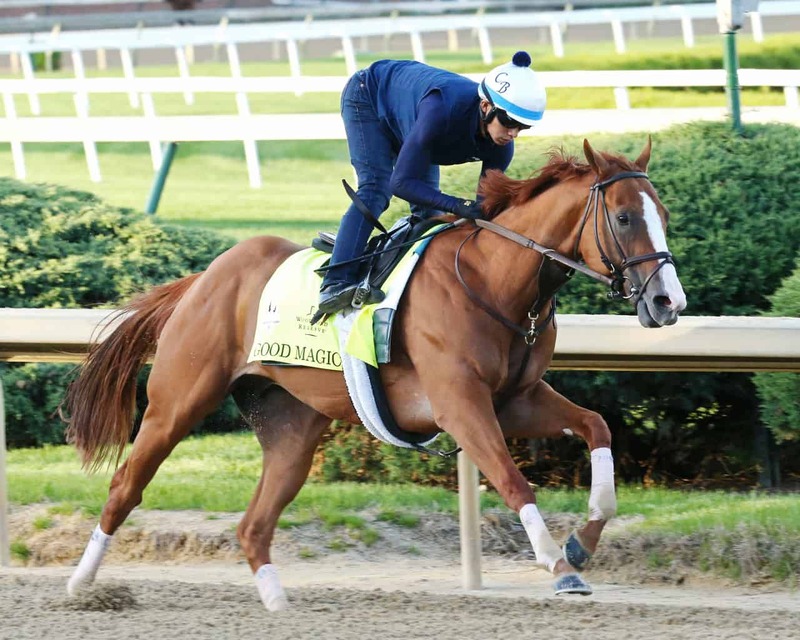 That race set him up for a fantastic effort in the Kentucky Derby, but his Preakness Stakes effort was probably the most impressive of all, as he went toe-to-toe with Justify the entire race. He finally gave in late in the race but was still only beaten a length as they crossed the wire. There is no doubt that he is the class of this field and should be very tough to beat if he shows up with his top performance. Brown believes that he is sitting on a big race. #5 Bravazo – Trainer D. Wayne Lukas has said from the beginning that this is a very tough horse, and he has proven to be right. This son of Awesome Again made starts in all three of the Triple Crown races and is now ready to roll in this spot. He is most famously known for nearly ruining Justify’s Triple Crown bid, as he was beaten by only a 1/2-length in the Preakness. In fact, if the race would have been just a few yards further, then Bravazo might have very well won the race. He comes into this spot off of a very sharp workout at Saratoga, which should set him up for another solid effort. #1 Lone Sailor – His connections have to be left wondering “what could have been” after a pair of heart-breaking losses in big races. Last time out in the Grade 3 Ohio Derby, he looked like a winner until the very end when Core Beliefs nosed him out. Four races back, it was much of the same in the Grade 2 Louisiana Derby, as he looked home free before losing to Noble Indy by a neck. This horse is training lights-out leading up to this race, but that is usually the case with him. One of these days, he is going to win a big one. #4 Core Beliefs – Last time out, the Peter Eurton trainee picked up the biggest win of his career in the Ohio Derby. Now, he will try to jump back in with the big horses, but he is no stranger to tough competition. Three races back, he took on the mighty Justify at Santa Anita in the Grade 1 Santa Anita Derby, as well as Bolt d’Oro and Instilled Regard. He was no match for the top two in that race, as Justify defeated him by over 9 lengths, but he did finish ahead of Instilled Regard, who came back to finish fourth in the Kentucky Derby. There is no doubt that this colt is improving with each start. #7 Golden Brown – This New Jersey-bred will take aim at the state’s biggest race. It would be quite the story if he could pull it off, and he is coming into the race off of a victory last time out in the Grade 3 Kent Stakes at Delaware Park. That race was on the turf, though, so the challenge will be how he reacts to the dirt surface in this tough Grade 1 spot. He did win a race over the dirt at this track three races back against state bred allowance company, though, which bodes well for him here. #2 Navy Commander – He looks to take on big-time company here after two wins in a row in smaller races. His victory last time out in the $100,000 Long Branch Stakes certainly makes him worthy to give a race like this a shot. If you take out the $100,000 Sir Barton Stakes, which was run over a sloppy track, then he has won four of his last five races. That kind of resume actually makes him sneaky in this spot, and he could be a longer price worth a look in a race where value might be hard to find. #3 Roaming Union – After a solid second in the local prep race for this one, it looks as though trainer Kelly Breen is ready to give Grade 1 company a shot. This colt has never been flashy, but he has held steady form throughout his 11-race career. He will be looking for his second lifetime win in this spot.